The degree of your farsightedness influences your focusing ability. People with severe farsightedness may see clearly only objects a great distance away, while those with mild farsightedness may be able to clearly see objects that are closer. With normal vision, an image is sharply focused onto the retinal surface. But, if you're farsighted, your cornea doesn't refract light properly, so the point of focus falls behind the retina. This makes close-up objects appear blurry. Farsightedness occurs when your eyeball is shorter than normal or your cornea is curved too little. The effect is the opposite of nearsightedness. In adults with farsightedness, both near and distant objects can be blurred. Nearsightedness (myopia). Nearsightedness usually occurs when your eyeball is longer than normal or your cornea is curved too steeply. 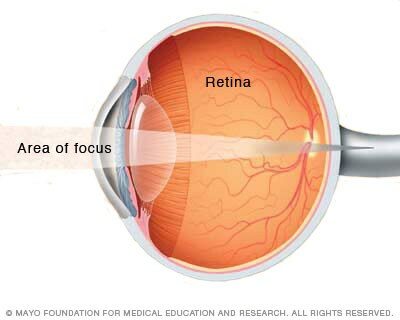 Instead of being focused precisely on your retina, light is focused in front of your retina, resulting in a blurry appearance for distant objects. Reduced quality of life. Uncorrected farsightedness can affect your quality of life. You might not be able to perform a task as well as you wish. And your limited vision may detract from your enjoyment of day-to-day activities. Financial burden. The cost of corrective lenses, eye exams and medical treatments can add up, especially with a chronic condition such as farsightedness. Care of the patient with hyperopia. American Optometric Association. http://www.aoa.org/documents/CPG-16.pdf. Accessed March 17, 2015. Preferred practice patterns: Refractive errors and refractive surgery. American Academy of Ophthalmology. http://one.aao.org/preferred-practice-pattern/refractive-errors--surgery-ppp-2013. Accessed March 17, 2015. 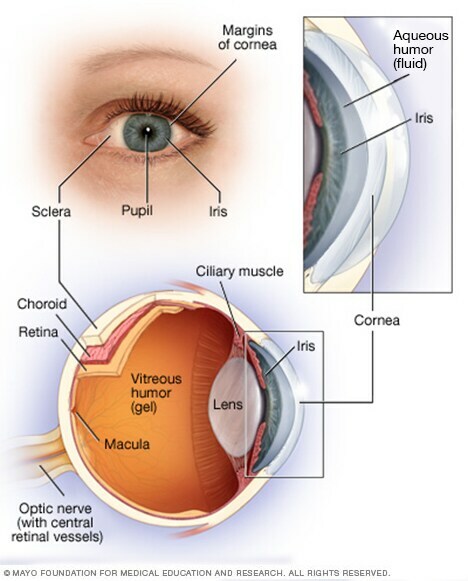 Overview of refractive error. Merck Manual Professional Version. http://www.merckmanuals.com/professional/eye_disorders/refractive_error/overview_of_refractive_error.html?qt=refractive error&alt=sh. Accessed March 17, 2015. Softing Hataye AL (expert opinion). Mayo Clinic, Rochester, Minn. Sept. 18, 2018.